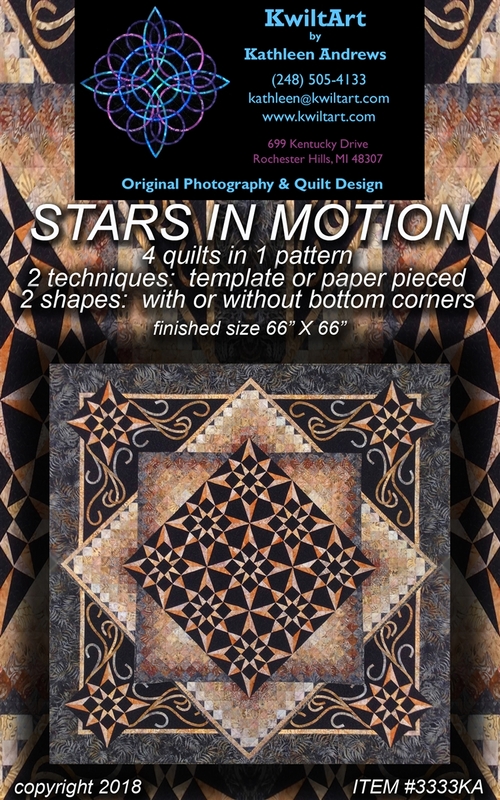 Stars in Motion is an INCREDIBLE VALUE pattern - 4 quilts in 1 pattern! You get 2 technique options - template and foundation paper piecing (full size master templates included for both). You also get two shape options - with or without bottom corners. The center stars create circular motion the way the star blocks are set and more 3D optical illusions are created with shapes and shading. This is for the intermediate quilter. Finished size is 66" X 66". 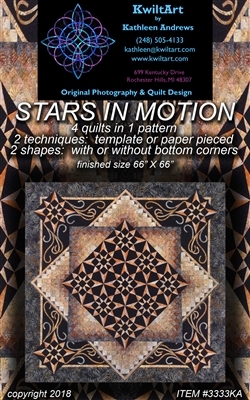 NOTE: A package of foundation papers is also available - see "Stars in Motion Foundation Papers" Item #3113KA. Press here (KwiltArt Etsy Shop) to order an instant download PDF version of this pattern.